Designer hotel brand QT Hotels & Resorts latest flagship property, QT Melbourne, has been recognised for its commitment to delivering the highest level of service at the Tourism Accommodation Awards for Excellence last night, awarded Deluxe Accommodation Hotel of the Year 2017. The Tourism Accommodation Australia (VIC) Awards for Excellence are recognised as the most prestigious hospitality awards, honouring high achievement in a wide range of categories in the accommodation industry. Located in the heart of Melbourne’s CBD with a striking façade designed by architect Angelo Candalepas, QT Melbourne boasts 188 unique guestrooms and an industrial-inspired interior design by longstanding QT collaborators, designers Nic Graham and Shelley Indyk. The hotel’s hallmark is a series of innovative restaurants, bars and shops including: The Cake Shop, a decadent patisserie in the hotel’s lobby; the signature French-style brasserie, Pascale Bar & Grill; the edgy laneway bar, Hot Sauce; the in-house handcrafted Japanese knife shop, Tanto; and a rooftop bar, The Rooftop at QT, overlooking Melbourne’s city skyline. The hotel also features a world-class video art collection on display throughout the hotel’s public spaces, assembled by renowned contemporary Art Curator Amanda Love. Having only opened in September last year this achievement marks one of many for QT Melbourne who was the only Australian hotel named on the 2017 “It List” comprising of the top new hotels in the world by the editors of the prestigious US travel publication, Travel+Leisure. 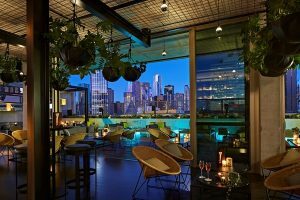 More recently, QT Melbourne was awarded “Large Hotel of the Year”, with the Rooftop at QT being crowned “Best Bar” at the Australian Gourmet Traveller 2017 Hotel Guide Awards.